NYC Restaurant Week kicked off on Monday, and while a cheap prix fixe at Nobu is mighty tempting, we know that in all likelihood we'll be inhaling a microwave dinner and re-bingeing on "House of Cards" (what exactly happened with China again?). And we're not alone. 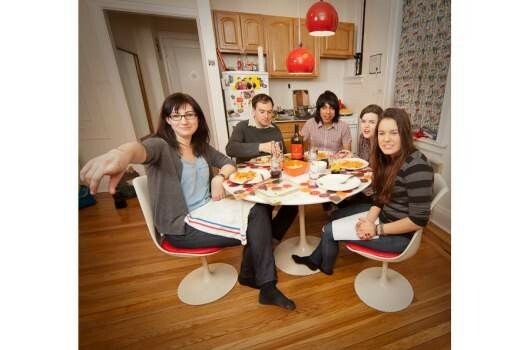 New Yorkers, often lacking proper dining rooms or accomodating kitchens, tend to eat in makeshift spaces, with the flicker of a digital device as company. 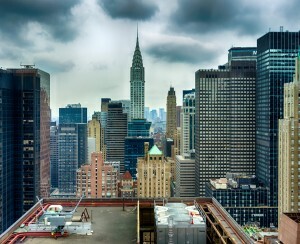 It's a phenomenon that caught the attention of Miho Aikawa, a Japanese photographer based in New York and Tokyo. Aikawa's ongoing project, Dinner in NY, is inspired by a study she read in Public Health Nutrition, which found that eating as a primary activity has declined in the past 30 years, while eating as a secondary activity has increased dramatically. Even though we're spending more time eating, we're focusing our attention on something else. 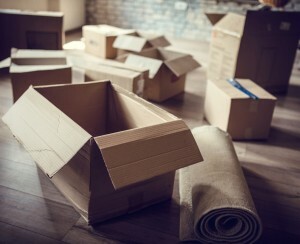 "Obviously apartments in New York are much smaller than in rural cities, but people seem to use the space very well," she says. Aikawa is working on a similar series in another highly populated and space-starved city: Dinner in Tokyo. 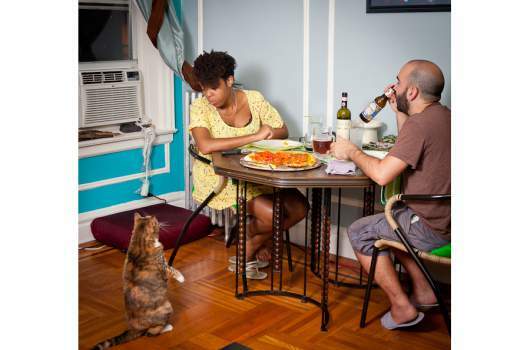 Garro Heedae is a musician who eats in his kitchen in Vinegar Hill, Brooklyn, after rehearsal. U Pa Mok Kha, a monk from Myanmar, eats at a low dining table in his Jackson Heights, Queens apartment. 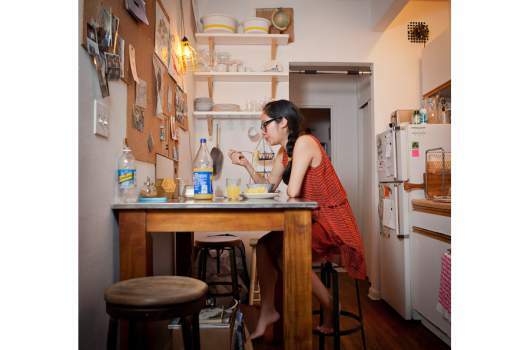 Queenie Monica Chan has an eat-in kitchen in her apartment in the East Village. 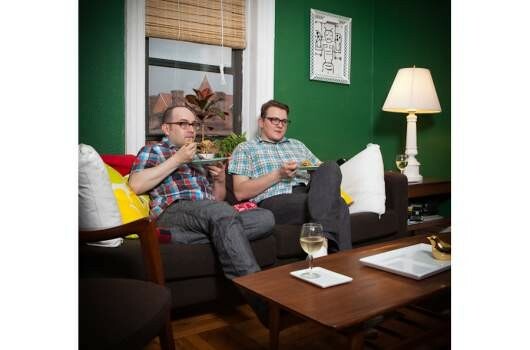 Jessie Zinke eats in bed at her Chelsea apartment while watching her favorite TV shows. 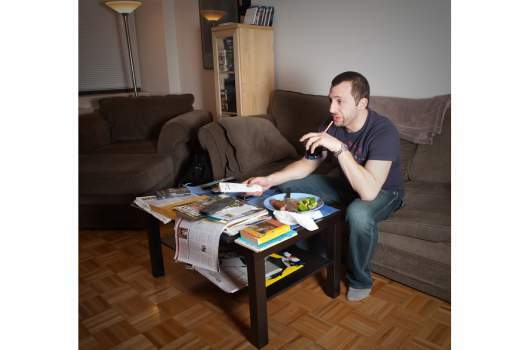 Seth Rabinoqitz is an actor who eats at his coffee table while watching TV in Midtown West. 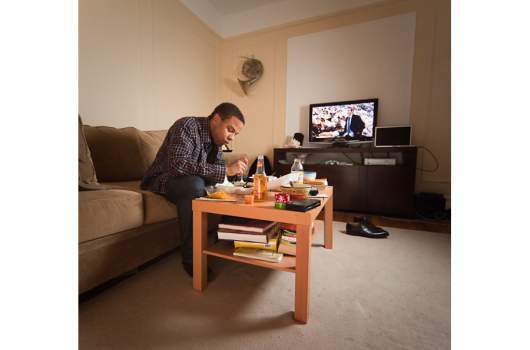 David Byrd is a musician who eats dinner at his coffee table while watching TV in his Prospect Park South, Brooklyn apartment. Tara Sharma and Lee McOmber (both food bloggers) might be the exception to multi-tasking New Yorkers, because they both love to cook and eat at the dining room table in their Upper East Side apartment. Emilie Rolin Jacquemyns is a graduate student who eats while studying at her dining room table on the Upper East Side. 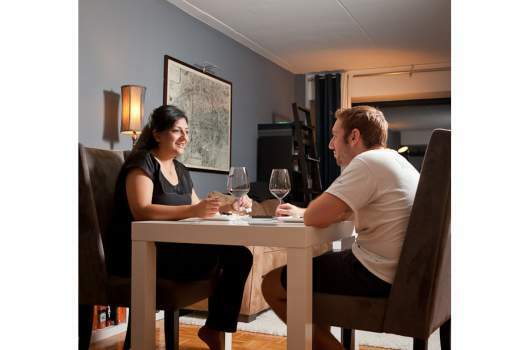 Kimberly Cherubin and Gregory Santos work non-stop so they try to make an effort to have dinner together at their Inwood apartment. 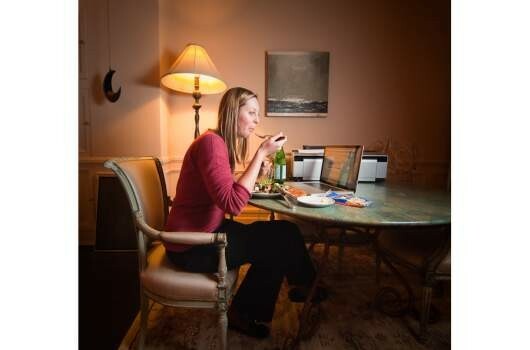 This is one of Aikawa's favorite dinner moments: A mom and daughter eat while video-chatting with grandparents in their Upper West Side apartment. Oona Wagner lives with her father and stepmother in Carroll Gardens, Brooklyn. She eats the dinner her dad prepared in her bed while watching TV on her computer. Bobby Blue and Joey Outten eat a home-cooked meal together in the living room of their Bedford, Brooklyn apartment. Zheng Yun lives with her son and daughter but typically eats dinner solo while watching TV in her kitchen in Vinegar Hill, Brooklyn.